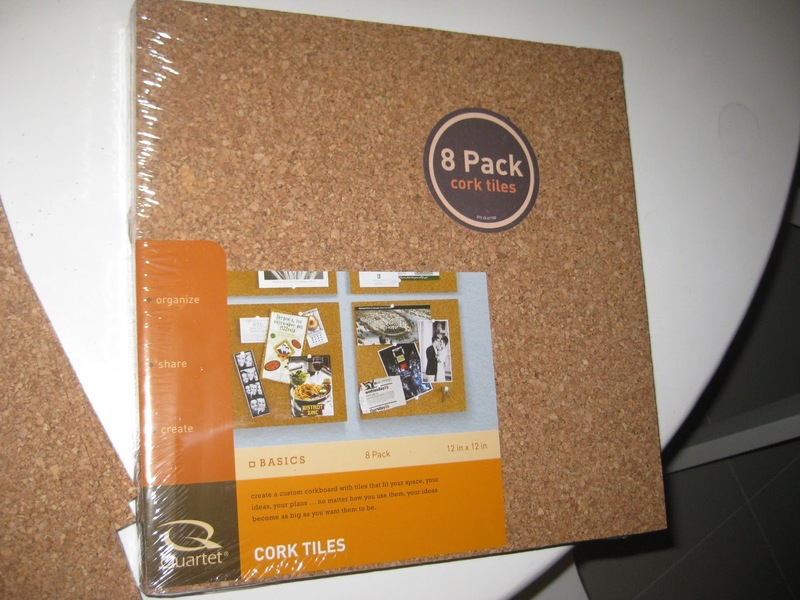 I decided to make a covered corkboard using cork tiles. Here’s how I did it! 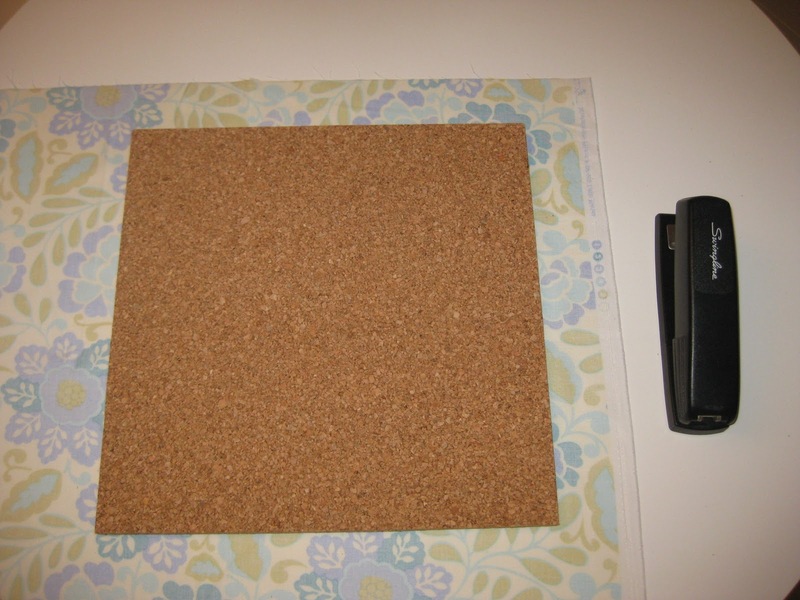 Gather your Cork board tiles; make sure the thickness is at least 1/4 inch by doubling up on thin ones. Lay over the backside of your selected fabric. 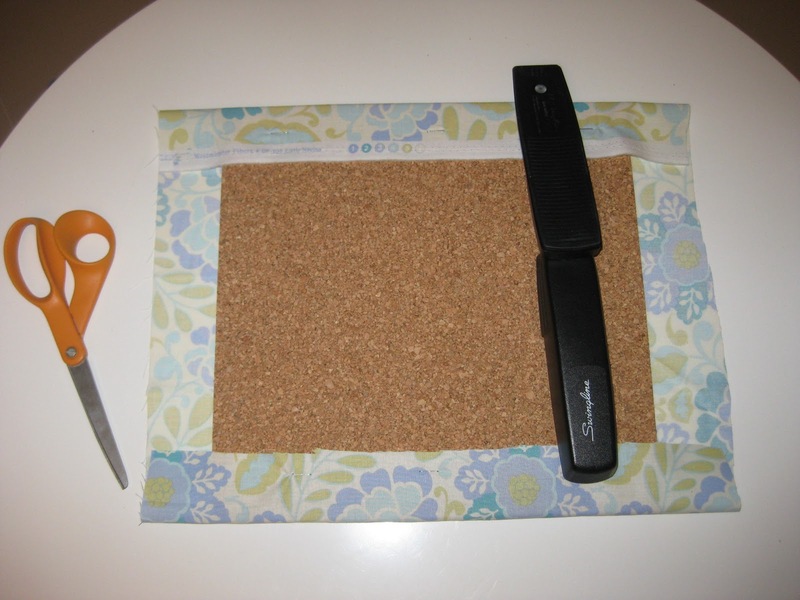 Gather scissors (which you already have in every room) and your stapler. Step 3: Trim fabric, leaving about 2 inches on each side. Fold over two opposite sides and staple tightly. 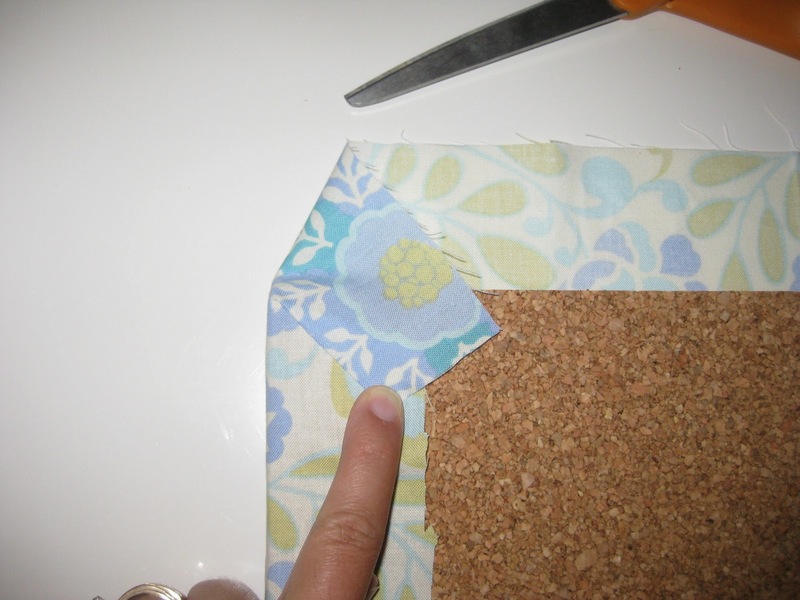 Step 4: To make corners, do a double fold as shown. First, fold over about a 15 degree corner of fabric. Hold in place or staple with just one staple. Step 5: Then, fold over the rest of the fabric. 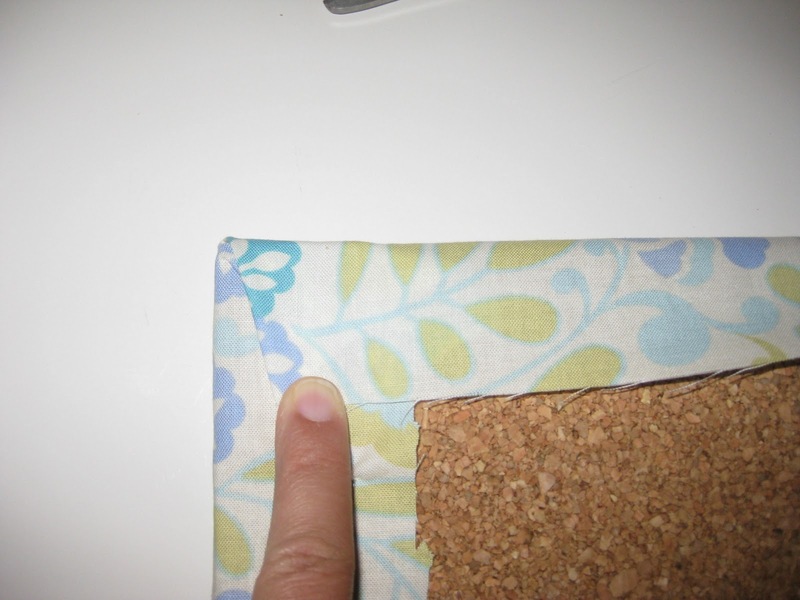 The idea is that you don’t have any fabric showing off the left side of the tile.Staple in place. Repeat for all 4 corners and staple as well along the edges between the corners. Finished tiles!!! 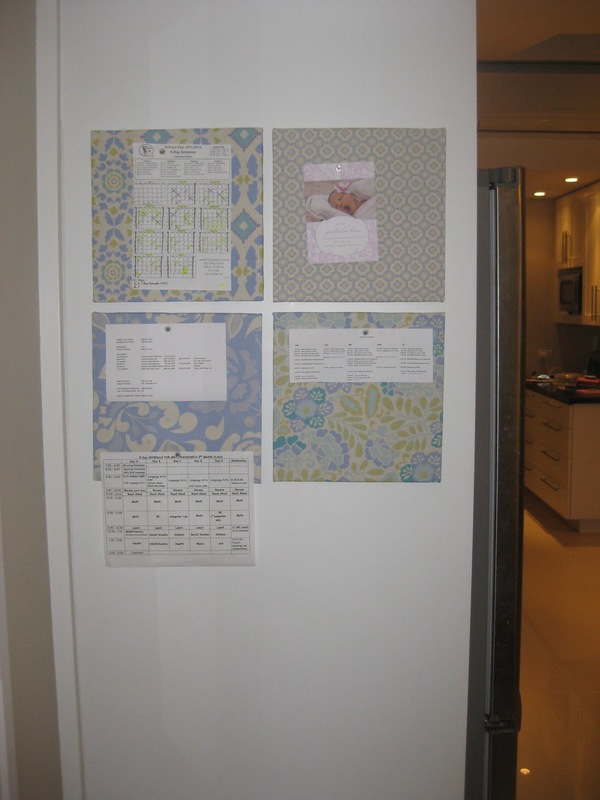 I used the two-piece velcro picture hangers that stick to the wall and to the tile, so that you can get the position just right as well as remove them later. 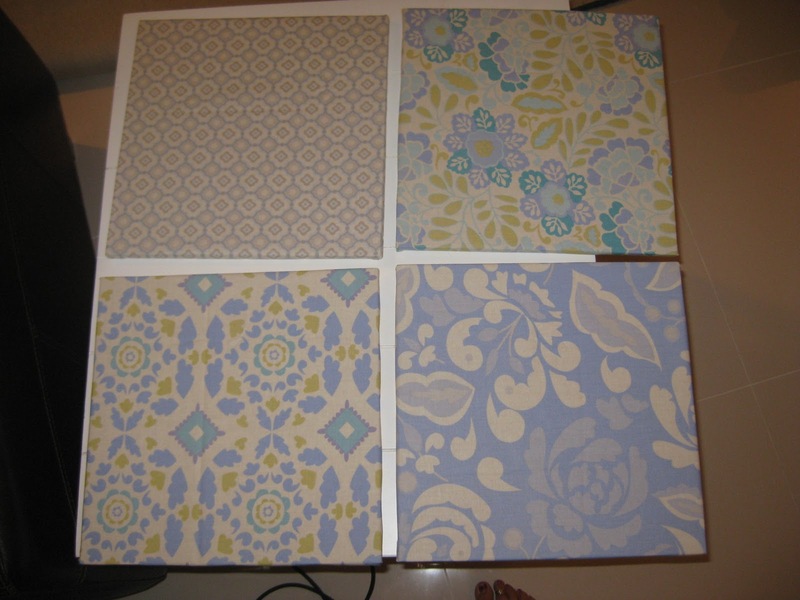 I tried to use 4 coordinating fabrics. I bought these as a package of 1/2 yard quilting bundle pieces from the Etsy store “The Intrepid Thread”. I just LOVE them together! This entry was posted in Art, Crafts, Decorating, Home Office, Kitchen, Laundry and tagged cork board, home office, paperwork, photos by organizedohana. Bookmark the permalink. You are so crafty,great job!!! Exactly the idea I was looking for! I like inspirational sayings and wanted a nice idea so that I can post them on a wall in my room. I want it to look nice and neat! This will be great!Thank you!